After chatting with some people regarding the Royal Alexandra Children’s Hospital, we got onto the discussion of who remembered the rocking horse that was in the outpatients waiting room? I spent a lot of my childhood in and out of the Alex during the 1970s and spent a lot of time on that rocking horse! After a bit of searching someone told me it was still around but now at the Tarner Centre in Morley Street. So I went along today to see it, and there it was, just as I remembered it, but much smaller. As it’s so fondly remembered I wonder if really it should be in the museum before it gets stuffed away in some cupboard somewhere because it’s no longer ‘safe’ for children to play on. Either that, or it should have pride of place at the new Alex building. 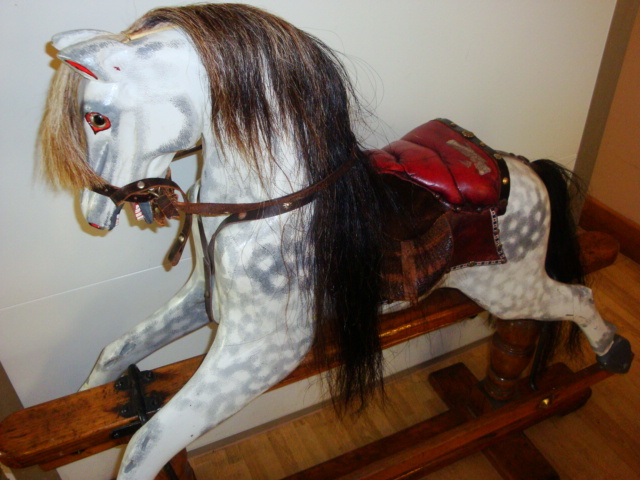 As a child (born in 57) and the youngest of three by a long way, I remember having a rocking horse exactly the same, although minus the mane and tail. My father sold it when I grew too old to use it, I remember he got 10 bob for it, i wonder what it would be worth now fully restored. Does anyone know were they originated from, never really thought much about it until I saw this picture. I do agree though that it would be nice for it to be returned to the new Alex building. How I laughed as I had the same experience when taking my son to the new wing of Lewisham Hospital in south east London. To my amazement I saw the old rocking horse in the waiting area of the childrens’ section, this was taken from the old Sydenham childrens’ hospital, SE26, that I had attended as a child. I wonder if they were connected. Last Days: A Photo Essay.